Twas another good night. I went to bed early and Amélie woke up at 5:30am. She then slept on a bit more as well once persuaded. There had been a light fall of snow overnight (maybe 3cm), which was already starting to melt when we went downstairs. Lu and I were really sleepy, and late morning we went back upstairs for a nap. Unfortunately Amélie rotated in the bed and was kicking me repeatedly so I had to go downstairs to the sofa, where I slept for about 10 minutes and then got up and watched TV. Late afternoon I took Amélie outside to play in the snow. 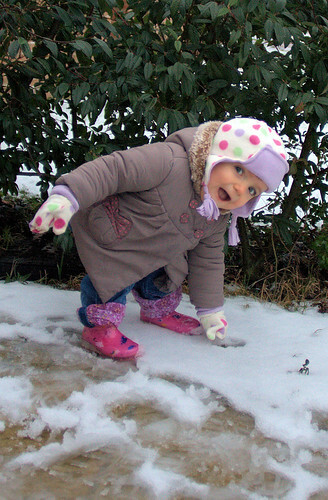 She was having great fun throwing snowballs, although initially she wouldn't even tread on the snow. When we were back inside we danced to music videos, although said dancing usually involves me carrying Amélie around and bouncing her up and down in a variety of ways, which is supremely knackering. All that's left to do is iron my shirts, although I'm debating leaving that for the morning due to sleepiness. You have the best photos of your little girl :D She always makes me grin! Thanks :-) It's always good to catch her cheeky grin!